Thanks for sharing the article Paul – a good one! I guess it is proof again that anything “new” is usually not that new. It is reassuring to see the benefits I am seeing are ones that seem to be widespread. I can attest to the value of the standup desk, Chris. I’ve used one for about 15 years, and I find that it increases my energy and productivity. And I also have fewer lower-back problems because of it. Nice Dennis. It make so much sense, it is interesting that we are coming to this now for kids and haven’t done a lot of it earlier. It is nice to see the conversation around personalizaiton is also looking at furniture – I am seeing kids with very different needs in classrooms. Hi Spencer – that is is a good looking chair. I was at Caulfeild this morning and saw a variety of tables and chairs being experimented with in classrooms. Probably the key is the range of different options for kids (and adults). I also have seen similar work at Irwin Park and West Bay. There is probably also secondary classrooms in our district that have been trying different furniture I am just not aware of them. Some of the collaborative tables I saw at Caulfeild included ones that were a white board top for working on together. Of course there are a range of entry points when it comes to money and furniture – I have heard stories from under $100 to several thousand dollars. Yes these chairs are a pretty penny, but it’s cool to see what a tweak of a chair or desk can do to the learning environment. I had chairs like this in my previous school and the vast majority of students loved them. Once they understand that you really mean “no, you cannot have hallway races” with them, they are great! It allows for varied groupings and for those who have trouble sitting usually moved just enough to satisfy the need for motion without being disruptive. I am finding in my first year as an administrator that I have so much “paper” work to do that I have a pinched nerve in my shoulder that causes numbness in my arm. Typing is so painful. Maybe a standing desk is just what I need. I have set up one at home – I just turned a tote box upside down and put it on my desk. There are some really simple ways to experiment with it and see if it works. I am sure standing is not for everyone, but it is probably worth a try. 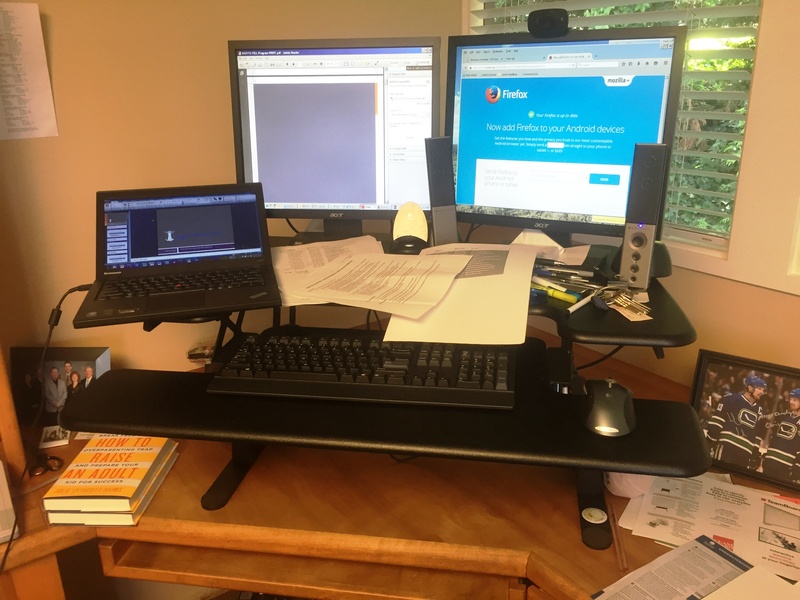 I love my standing “desk” further transformed my office (got rid of traditional desk for table a few years ago) but love my $35 telescoping desk though I sometimes do need to sit – on my exercise ball! But I really do prefer standing although I still find it awkward at PVP meetings and conferences when I am repeatedly offered a chair and politely decline – but the peer pressure is noticeable! For now….. I love this post Chris and will be sharing throughout my network – I also have “sitting is the new smoking” in my email signature, so guilty as charged. Congrats on the extra steps!